Lipstick can be one of the trickiest beauty products to work with. After all, we all know it is prone to smudging and smearing, which can lead to some embarrassing moments. Ever check the mirror during a bathroom break to find that you have lipstick on your teeth? Yeah, it’s happened to me too from time to time. Here are a few simple lipstick hacks to prevent those embarrassing moments while looking fabulous. Use a finger to save teeth from coloring: Save yourself from the embarrassment of lipstick teeth by using your finger. After you have applied lipstick, wash your hands well and stick a clean index finger in your mouth. Wrap your lips around your finger and pull it out. Any lipstick that would have ended up on your teeth will be on your finger instead. To ensure a smooth application, warm your lip pencil: First, start by using a sharp lip pencil. Then, before you use it, warm it between your thumb and index finger for a few moments. This ensures a smoother lip color application. Never forget lip balm: Lipstick has a tendency to dry out your lips. Keep them hydrated when you’re not wearing lipstick by using a high quality lip balm. 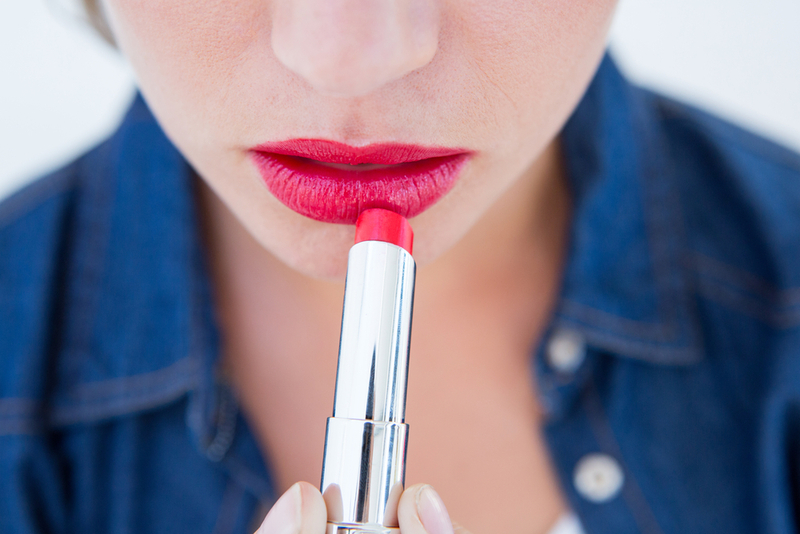 Make sure you don’t apply lip balm before your lipstick though, because this can lead to some serious smudging. Exfoliate properly: The skin on your lips is delicate and thin, but even it needs exfoliating every now and then. Use a gentle exfoliator, such as a warm washcloth, after you take off your makeup. Start by rubbing the cloth in small circles until your lips start to tingle. If you do this every day, your lips will start to feel and look amazing. X marks the spot: Defining your cupid’s bow can be a challenge. If you struggle to define it, start by using a lip pencil to draw a tiny “X” at the top center of your upper lip. Then start lining your lips from that point out and you’ll nail it. Eat and drink before your lip color goes on: Sometimes, you have to use a little strategy when it comes to your lip color. If you are about to eat lunch, or drink a cup of coffee, do all of your makeup but the lipstick, and then apply it afterward. This saves you from having to deal with smudged lipstick or having to reapply later. And ultimately, you’ll save money on lipstick if you wear it wisely! Conceal for a cleaner look: After you have applied your favorite red lipstick, use a small brush to apply concealer to the edges of your lips. This keeps your foundation looking clear and prevents your lip color from bleeding onto the skin around your lips. Although wearing lipstick can be a little intimidating, master the art of having beautifully colored lips with these simple lipstick hacks. Hopefully now you have all the confidence you need to grab your favorite lip color and start rocking it!